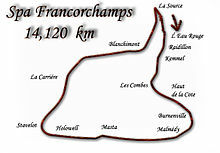 The 1965 Belgian Grand Prix was a Formula One motor race held at Spa-Francorchamps on 13 June 1965. It was race 3 of 10 in both the 1965 World Championship of Drivers and the 1965 International Cup for Formula One Manufacturers. The race was won by British driver Jim Clark who led every lap of the race driving a Lotus 33. It was one of the Scot's most dominant wins. In the rain, he pulled away and with a third of the race to go, the Lotus driver was leading his fellow Scotsman Jackie Stewart by 1 minute and 20 seconds. However, for the last six laps Clark eased off dramatically and when the chequered flag was waved his lead was down to just under 45 seconds. ^ "Jim Clark's 1965 season". peterwindsor.com. Retrieved 17 January 2017. ^ "Belgian Grand Prix: Scotland Forever". MotorSport Magazine Archive. 13 June 1965. Retrieved 28 December 2018. ^ "1965 Belgian Grand Prix". formula1.com. Archived from the original on 30 October 2013. Retrieved 26 September 2015. ^ a b "Belgium 1965 - Championship • STATS F1". www.statsf1.com. Retrieved 12 March 2019. This page was last edited on 12 March 2019, at 14:20 (UTC).